July 30, 2018: here you see a dual image of two horoscopes of the Summer Solstice 2001 Solar Eclipse and the Summer Solstice Solar Eclipse of 2020. In 2001, the eclipse perfected on June 21 @00Can10 and was the Prenatal Eclipse of the WTC attacks on 9/11/01. In 2020 an eclipse will manifest on June 21 @00Can21. Both charts are set for Washington DC as representative of America. The two eclipses are 'time links' by degree, not by Saros Series. Note that in Political Astrology I tend to work with eclipses symbolically by degree, sign, stars, sensitive and critical degrees, etc. For as you know, eclipses affect history by expressing through individuals via an eclipse's links to a person's natal chart and planets. Those who are in an eclipse's path of visibility may 'feel' the effects more strongly, yes, but even if one is located 'out of the path', eclipses occur and have influence even so. For one thing, an eclipse manifests approximately every 18.6 years in the same Saros Series as the series a person is born into (their Prenatal Eclipse or 'PE') so whether a person is located at the time in path of visibility or not, it's 'their' personal eclipse. An example is the recent solar eclipse on July 12, 2018 @21Cancer in Mr. Trump's 2 Old North Saros Series which occurred while he was abroad and perfected two days prior to his 'Helsinki Summit' with Mr. Putin. That 2 Old North themes of 'unfortunate news' and 'separation' affected Trump personally seems apparent to me if not you. Now as you know, 00Cancer, a critical degree, is one of the four Cardinal Points of Manifestation denoting events occurring on the world stage and this alone makes an eclipse upon this degree significant. Will a similar attack be heralded by the 2020 eclipse? They say history doesn't repeat but it rhymes yet I'm not prognosticating such a game-changing terrorist assault. Even so, most folks feel that major shifts are occurring now across the globe--politically and in the physical world via natural (and man made) disasters--and leaders tend to wage wars when they feel their domestic support waning. So with the chaos-loving Uranian Trump's quixotic finger on The Button, who would care to guess how he'll 'jump' in 2020--or even this afternoon? 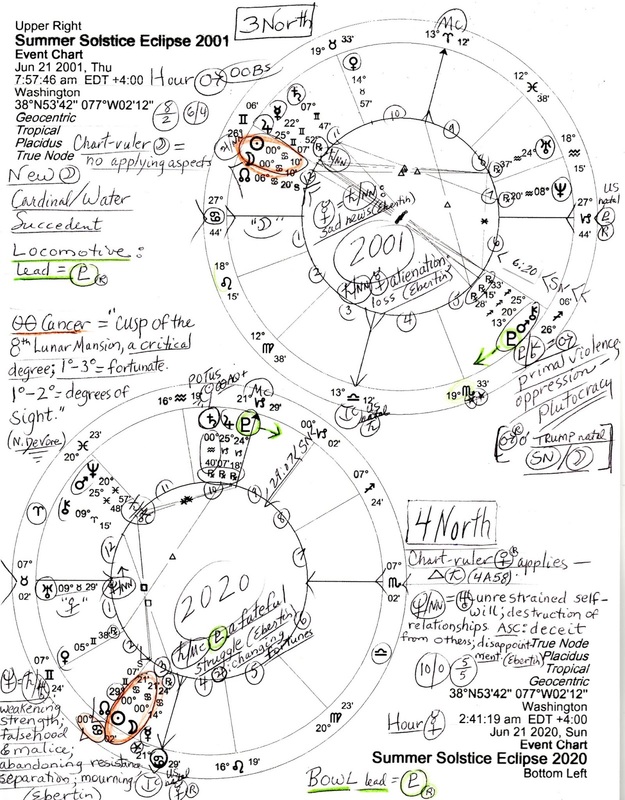 As you see, the 2001 eclipse (upper, right) occurred in the 3 North Saros Series with themes of: 'news involving young people and/or news that transforms a situation; information that causes worry and obsession; large plans are undertaken which may be over-excessive'. Past 3 North eclipses are PEs for the likes of the CIA, William Howard Taft, James Monroe's second inauguration, John Quincy Adams, Hillary Clinton, and J.K. Rowling. Its initial manifestation occurred on October 10, 991 @22Gem06 (conjunct US natal warrior planet Mars--and Donald Trump's natal Sun, btw, engaged in a trio with his natal North Node and guiding planet, Uranus). Soon a 3 North eclipse will 'come again' on July 2, 2019 @11Cancer--among America's natal Cancerian trio of Venus, Jupiter, and Sun. 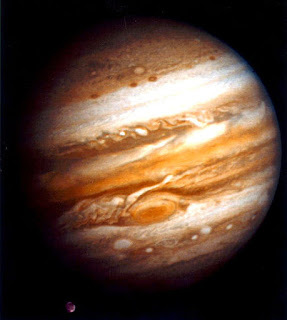 Of course, Venus and Jupiter relate to finances, currencies, and money supply, the Sun to leadership. 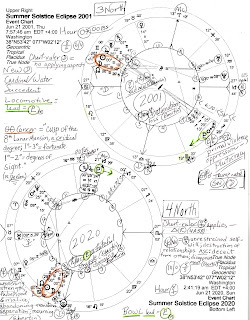 The Summer Solstice Eclipse of 2020 perfects in the 4 North Saros Series. Its difficult themes are: 'illusions, restriction, inhibition, separation; events seem to block individuals who tend to misjudge strengths or situations; take no real action until the influence of the eclipse passes'. The initial 4 North eclipse occurred on May 25, 1389 @12Gem08, a position some see as America's natal Descendant. 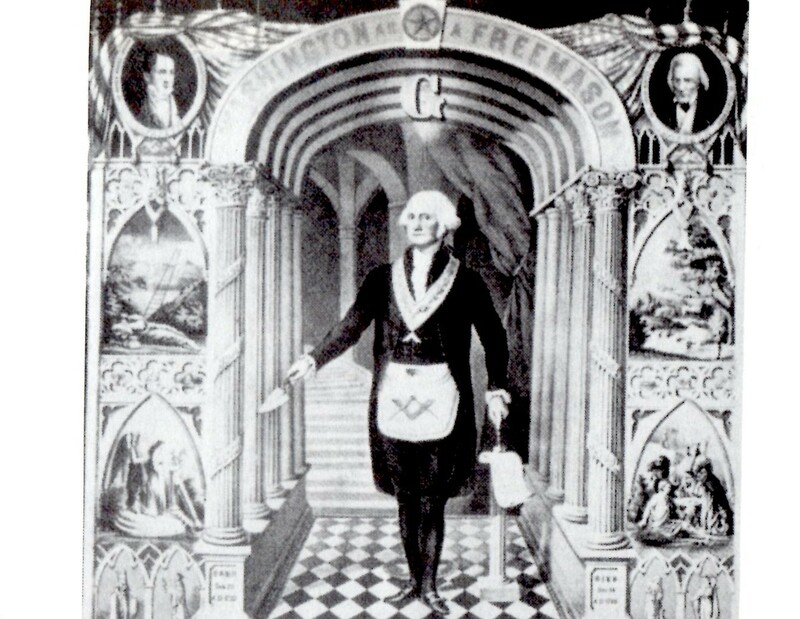 Interestingly, 4 North is the PE of: George Washington, George Soros, Prince Harry, the State of Israel, and Katy Perry. 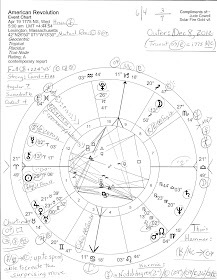 So the 2001 and 2020 solar eclipses in Moon-ruled Cancer (plus, Trump's in July 2018) should be viewed through a Mercurial Gemini lens due to their initial manifestations. An eclipse in Gemini spotlights logic, fluency, and the coherent expression of ideas. Negative traits include superficiality, loquaciousness, and caprice along with a tendency to communicate without forethought. Those born under a Gemini eclipse may tend toward garbled sentence structure, splintered positions, and duplicity. Unsurprisingly, Donald Trump's PE occurred in 1946 @9Gemini (conjunct US natal Uranus, our 'war and revolution' planet of shocks and chaos.) The gathering of information is also a Gemini eclipse influence along with gossip, news, and a dependence on poll-taking, all of which relate to Trump. Solar eclipses in sensitive, receptive Cancer are associated with imagination, emotional extremes, emotional withdrawal (Cancer, the Crab hiding in its shell), karmic family ties, psychic ability, shrewd business moves, and an interest in Genealogy. Well, that's all I shall type for now on 3 North and 4 North except to remind myself that all eclipses are 'wild card of the Universe' and 'cosmic blinks' which affect human history and individuals with their game-changing energies that are very similar to planet Uranus in its capacity to disrupt, separate, and reveal hidden factors which may be extremely inconvenient for all those involved.